I can’t speak for other Kuala Lumpur hotels, but the D’Majestic Place by Swiss-Garden was worth splurging every penny on. We chose it for its central location in Kuala Lumpur city centre and the rooftop infinity pool with a city view. With a 4* rating, the D’Majestic Place is one of the best hotels in Kuala Lumpur – and that also means it’s one of the most expensive. But when I say splurge, I’m talking around $60 (£46) per night – for an upgraded Studio Chic room. It’s ideal for solo travellers or couples who want to stay somewhere special (and enjoy lots of space!) in Kuala Lumpur. And if you’re travelling to Kuala Lumpur with children, Booking.com recommends the D’Majestic Place as a family-friendly hotel. Like much of South East Asia, Malaysia is an affordable travel destination. 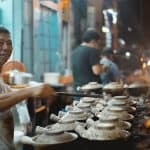 It’s far from the cheapest country in the region, but a short layover in Kuala Lumpur certainly won’t set you back in the way a layover in many capital cities around the world would. Our Studio Chic room at the D’Majestic Place hotel came with a (very!) 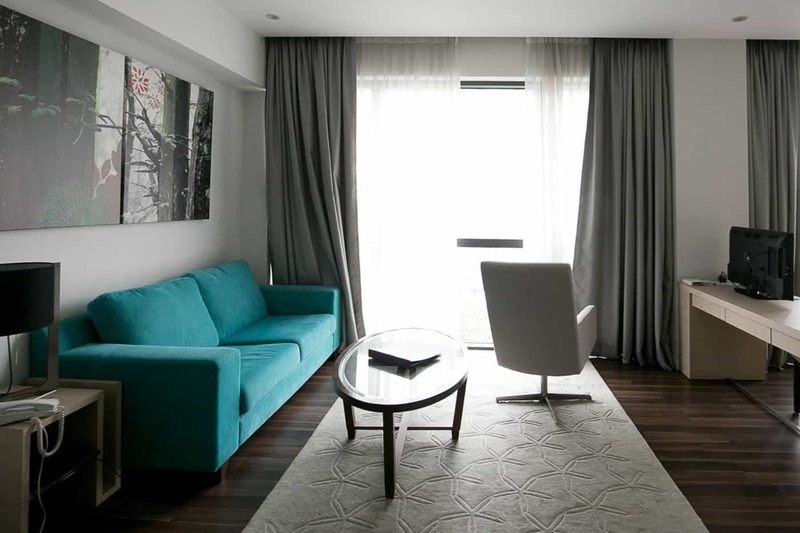 large bed next to floor-to-ceiling windows, with views over the city. A desk with a TV separated off the living area, wardrobe, fridge area and entrance to the room in one direction. 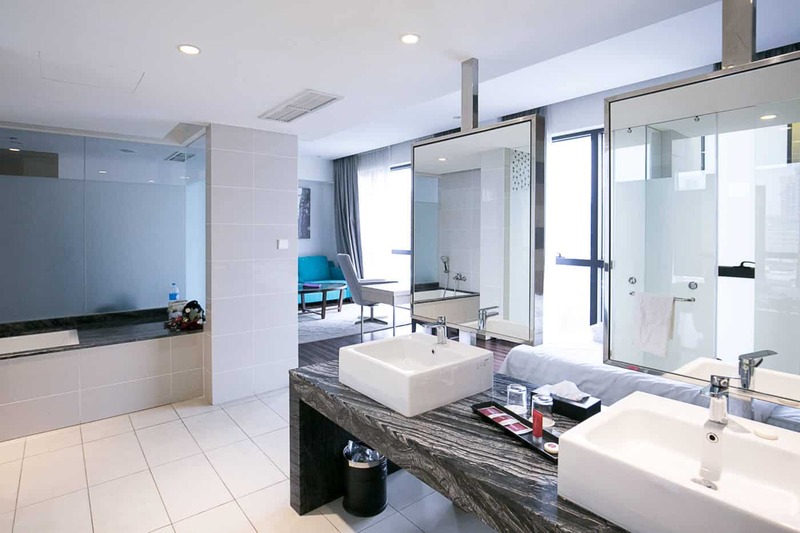 To the side of the bed, a double sink separated off an open-plan bathroom with a shower cubicle, toilet cubicle and open bathtub. The room was bright, airy and spacious – probably more so than the studio apartment we’re now living in for a month in Chiang Mai! My only complaints, if any, would be the fairly hard bed – typical of South East Asia, but I’m the type of person who likes to drown in fluffy pillows – and the amount of light that came in through the bathroom windows at night. Otherwise, it was pretty heavenly. I couldn’t talk about the D’Majestic Place without mentioning the pool, especially as it was one of our main reasons for booking! If there’s one thing you should do when visiting Kuala Lumpur, it’s find a rooftop with a view of the Petronas Twin Towers. Better yet if that view comes with cocktails or a pool. The infinity pool at the D’Majestic Hotel fits the boutique style of the rest of the hotel and comes with a pretty impressive view of the towers, especially during sunset. The Instagram shoot in my Batu Caves vlog resulted in this shot below with the towers lit up in the background – pretty, right? And don’t worry about the fact that the pool is completely outdoors and uncovered: the Kuala Lumpur weather is so humid that you’ll just want to dive head first into the pool, even when it’s raining! The D’Majestic Place is located right in the heart of KL’s city centre. It’s just a 15-20 minute walk to Chinatown, where you can shop, eat and people-watch to your heart’s content, and less than 10 minutes’ walk to the nearest monorail stop. If you’d rather take a taxi, it’s easy to flag one down because the hotel is right on the main street of Jalan Pudu, or you can request an Uber or a Grab. 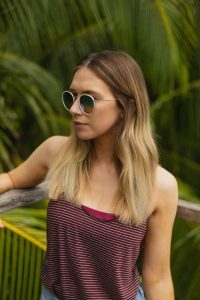 There are plenty of budget hotels and 5 star hotels in Kuala Lumpur, but the difference in price really isn’t much and so I’d definitely recommend looking at the top hotels if you enjoy a little luxury – especially after a long flight. 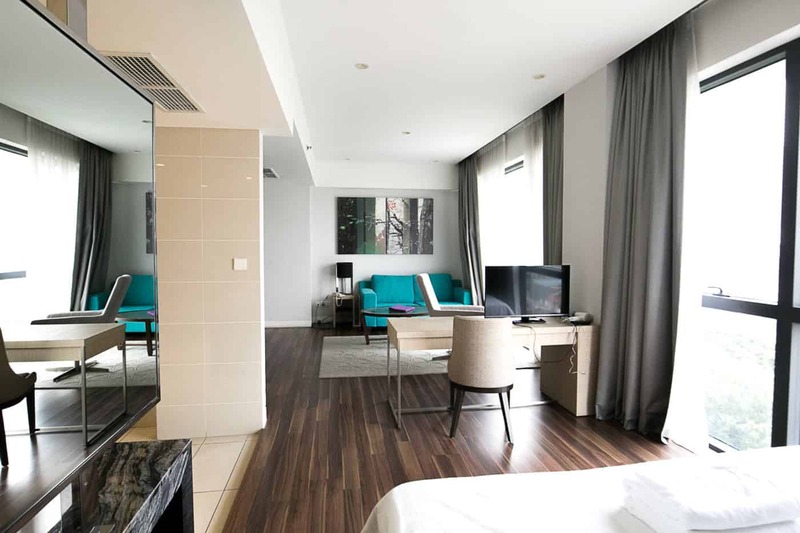 There isn’t really a “best” area to stay in Kuala Lumpur, but if you’re booking a long layover there, be prepared for a fairly lengthy journey from Kuala Lumpur airport. It took us nearly two hours to reach our hotel during rush hour, so you may prefer to be near the train station and take the express service from the airport if your layover isn’t quite as long as ours! Because there are so many modes of transport around (monorail, train, taxi and bus, to name just a few), Kuala Lumpur is a really easy city to get around. Which is just as well because there’s loads to explore – so whichever hotel you choose, don’t spend too long in it!